Armchairs joined by a two-tier table with parasol hole in the middle. Perfect spot to relax in the garden or on the patio. make the most of the afternoon in the sun. This classic patio love seat is beautifully. An excellently crafted set featuring two armchairs and an adjoining table with a parasol hole. Wood: Pecan. Made using Malaysian hardwood. 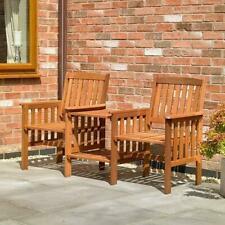 Excellently crafted garden furniture. Outdoor aftercare instructions included. Durable hard wood construction. We will be happy to help! Instructions included. Wetherproof finish. 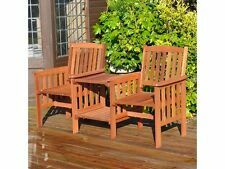 These Luxury Garden Love Chairs are the perfect piece of furniture to help you make the most of the afternoon in the sun. 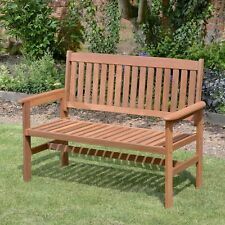 This classic patio love bench is beautifully made & will provide a lovely spot to enjoy a morning coffee or an evening glass of wine.